And lastly, I have finally bought a bag for work. 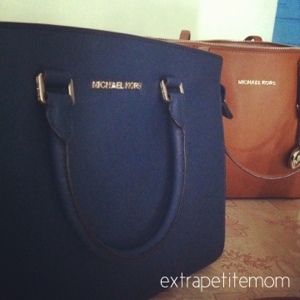 Some of you might have guessed it right, I bought MK Selma in Navy. That's the most neutral colour in my opinion thats similar to black. I was surprised when I decided to buy it, it was not available in MK site anymore. Anyway I'm glad Kaki Kecil managed to find it from affiliate site (don't know where!). That's aside, I'm happy that the bag arrived finally!!! It's so funny though lol. The Color Tattoo (green and orange) creases on me :O but the essence ones doesn't which is weird. 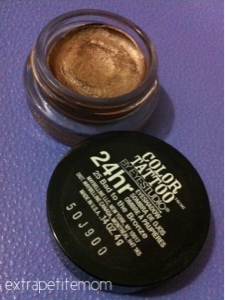 I guess it being a bit more harder to get on, works well for my oily lids lol. Did you use primer when you used them? Maybe bcos its different colour so the other creases. Mine is ok, last pretty long bcos at night around 9pm baru I wipe off and still looks ok, colour fades a little though but it didn't crease. Sometime pakai primer, sometimes not but either way both last pretty long. Cool! I love Colour Tattoos! I have 3 of them now and going to write a review on them soon. They are really nice and really blendable on my eyelid though I used Mac Painterly Paint Pot first. And guess what, you can get it Brunei too. I'm not sure if they have in Guardian but I saw them at Hua Ho supermarket at Manggis mall and I think it's around BND9+. Of course they don't have the new colours but still.. Hehe.. I bought it from Guardian disini, Sheila. It cost B$10 each. After I see reviews from Youtube for other colours atu inda ku jadi beli psl the texture is different than Bad to the Bronze. Try to look at Macy's and Neiman Marcus site, I think they still have Selma in black. ohhhh.. They have it arah Guardian??! hahha.. Di Hua Ho I believe it's few cents less. Hehe... Colour tatoos I bought mostly the natural one and the grey one. Yg colour nda.. baik jua.. Hehe..